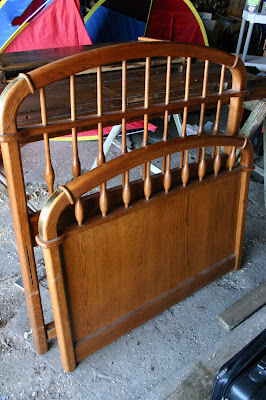 We were given this bed (thanks Mom! 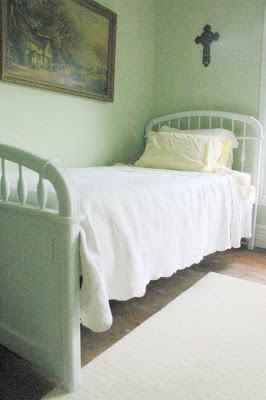 ), which has a trundle and I thought it would be great for the guest room - with a little help. I wasn't so keen on the 80's plastic-y style wood. So I sanded it a little, put on three coats of primer and made my own hole in the ozone with spray paint, glued on some fancy carved decal thingies that I bought at Michael's and came up with.... this! 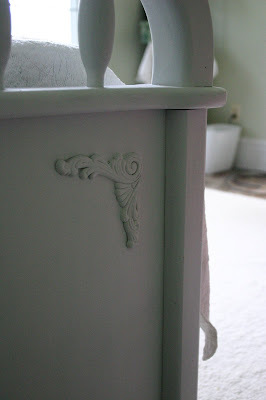 In my opinion, some things just breathe a sigh of relief in a coat of white paint. My husband, on the other hand, is of the male species that believes that painting wood is blasphemous! Lucky for me, he agreed thatthis transformation was for the best. I love it! Very good!